Convert inch fractions to decimal, convert decimal to inch fractions, convert inches to metric measurements, convert metric measurements to inch fractions, and convert to feet automatically. The chart below can be used to easily find the correct fraction for your decimal measurement, or vice-versa. 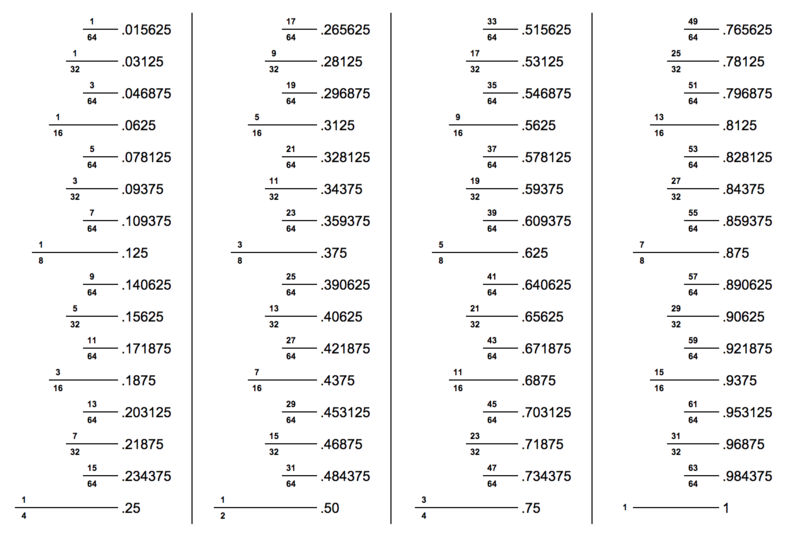 Find decimal equivalents in 1⁄64” increments, including 1⁄2“, 1⁄4“, 1⁄8“, and 1⁄16“, and 1⁄32” measurements. The chart also shows hints on the markings sizes found on a tape measure or ruler. Inch fractions use denominators that are powers of 2 and go up to the 64th of an inch. That means the fraction denominators will be 2, 4, 8, 16, 32, and 64. As a result, converting a decimal to an inch fraction is not as simple as finding the nearest fraction. Instead, it is necessary to find the nearest fraction with the denominator that is a power of 2. Typical inch fractions will look something like 1/64, 1/32, 1/16, 1/8, 1/4, or 1/2. Use our feet and inches calculator to add or subtract feet and inch fractions. Finding measurements on a ruler or tape measure can be confusing at first, but once you understand how the marks are laid out, then it is far simpler. 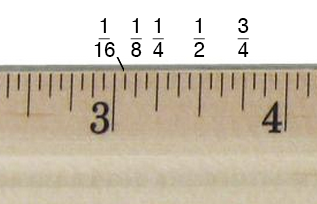 The markings between the larger inch numbers vary in length. The longest markings will be the quarter inch markings, ie. the first marking is 1/4 inch, the second is 1/2 (2/4) inch, the third is 3/4 inch. The next longest markings will be the eighth-inch markings, ie. the first marking is 1/8 inch, the second is 3/8 inch, the third is 5/8 inch, etc. The next longest markings will be the sixteenth-inch markings, ie. the first marking is 1/16 inch, the second is 3/16 inch, the third is 5/16 inch, etc. Download a free printable ruler with fraction measurements marked to help learn how to find the inch fractions for a measurement and for easy reading. To convert inch fractions to metric measurements, use our handy length measurement conversion tools. Convert from inches to metric or imperial measurements or centimeters to inches. See equivalent length measurements in fraction, decimal, and metric up to one inch in 1⁄64” increments. Use this to convert decimals to inches and millimeters. Use our full suite of fraction tools to add or subtract fractions, and perform other operations. Solve for x in an equation with a fraction using our solve unknown numerator or denominator calculator. The calculator shows all of the steps so you can show your work. Are You Planning a Trim Carpentry Project? Get hassle-free estimates from local trim carpentry professionals and find out how much your project will cost. Find the greatest common denominator for a set of numbers using the common denominator calculator. The calculator shows the work so you can see the all of the steps. Find the greatest common factor and all factors for a set of numbers. The calculator shows the steps to find the greatest common factor so you can show your work. Convert a decimal value to a fraction using the decimal to fraction calculator. The calculator shows all of the work so you can see the steps.